Summertime means figs, and you can’t eat just one. That’s because you can’t buy just one. In fact, you can’t really buy less than a one-kilo bucket at a time. Well, there are worse plights in life. 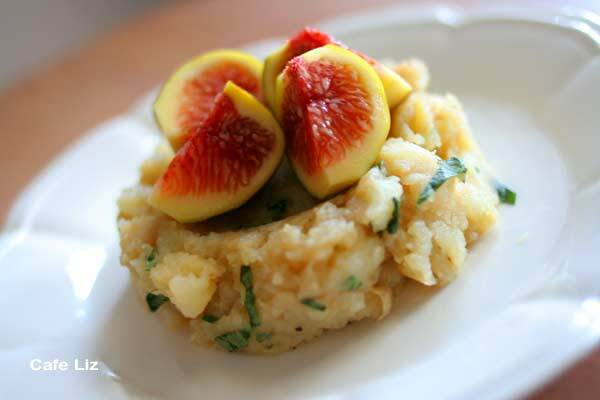 Figs are quite an attractive fruit, and can dress up any dish. 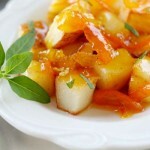 I’ve been mixing them with all kinds of savory things, since I find them too sweet to eat on their own. My cheese guy got me to buy some Roquefort last week thanks to his figs-and-Roquefort display in the window — figs sliced open, with a cube of Roquefort stuck inside. It’s quite a good snack. I’ve been tossing figs with pasta, cheese and basil, too. Also a nice combo. Today’s combo is mashed potatoes, seasoned with balsamic vinegar, basil and figs. I sculpted mine into a little mound. Presentation improves taste, after all. You can easily make this recipe parve or vegan by replacing the butter with margarine or olive oil, or just omitting it altogether. Dice and boil the potatoes (I don’t bother to peel mine). Once the potatoes are soft, drain and mash with the butter, vinegar, basil, salt and pepper. 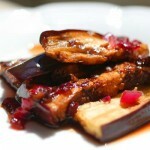 Arrange into attractive mounds and top with slices of figs. 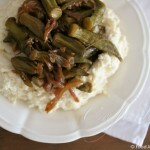 4 Responses to "Mashed potatoes with balsamic vinegar, basil and figs"
you are growing fig in a pot??!! WOW! we were planning to plant fig in the backyar, really did not know that u get fruits so quick. all the more inspired now. the recipe is awesome. you come up with the most unique combinations & make it look good! Thanks Soma! I think it produced fruit so quickly because it was grown from a cutting, not from seed. 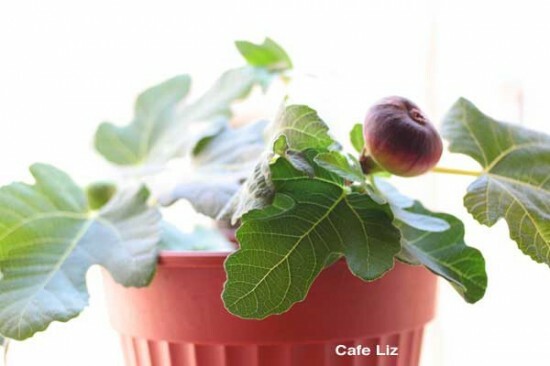 I’m sure a fig tree will do a lot better in a backyard, with lots of room to grow.